Assaying Antibiotic-Resistant Bacteria In Raw Sewage Pinpoints Hot Spots : Shots - Health News To track the spread of bacteria that resist antibiotics, researchers are trying wastewater testing to get a fast, accurate picture. 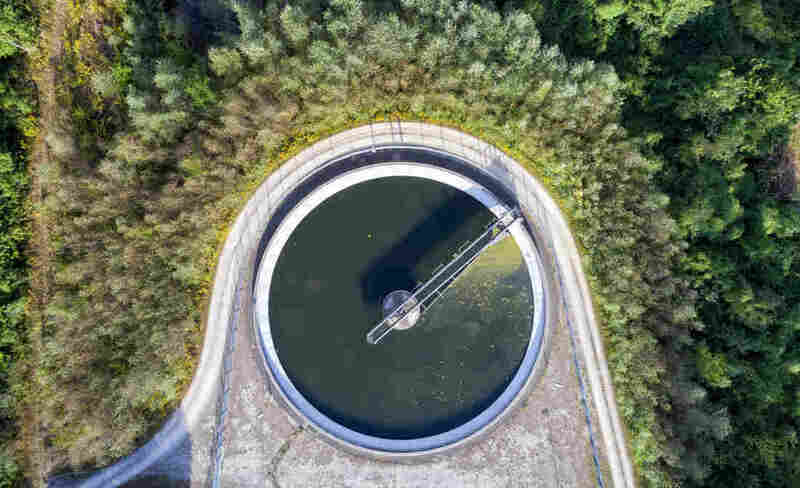 Researchers tested sewage across Europe, including in Germany, where this treatment plant is located, for bacteria with resistance to antibiotics. Humanity is rapidly approaching a post-antibiotic era. Overuse of these miracle drugs has contributed to the emergence of many bacterial strains that are resistant to once-effective treatments. Our interconnected world and bacteria's ability to quickly swap genes that confer resistance with distant relatives make mapping hotbeds of resistance especially important. Sewage would be a good place to start, according to a study published Wednesday in the journal Science Advances. The paper highlights how tracking antibiotic-resistance genes in bacteria found in urban wastewater treatment plants could help scientists and public health officials get a fast and accurate picture of resistance in a city. The team of European scientists validated the approach by using it to identify known trends in antibiotic use and resistance across Europe. "This is really important work," says Amy Pruden, a professor of civil and environmental engineering at Virginia Tech, who wasn't involved in this study. "Some call [antibiotic resistance] the biggest health challenge of the 21st century. We've been studying it in hospitals and clinics and the problem is not going away. Environmental surveillance is a big missing piece of the puzzle." Currently, programs like the National Antibiotic Resistance Monitoring Network in the U.S. or the European equivalent, European Antimicrobial Resistance Surveillance Network, monitor levels of resistance by collecting samples of bacteria from people in hospitals. This monitoring is happening relatively late in the game, after the resistant bacteria have already caused harm, and can be expensive and time-consuming, according to the authors. "If you want to see a mirror of the urban environment from a microbiological perspective, you have to look at wastewater sewage," says Célia Manaia, a microbiologist at Universidade Católica Portuguesa who co-led the study. She says that the concentration of antibiotic-resistance genes in sewage makes treatment plants ideal monitoring sites. But whether such monitoring would be feasible and accurate on a larger scale was unknown. Manaia and her colleagues set out to demonstrate that it could work by using existing data as a reference. EARS-Net has been monitoring antibiotic resistance in hospitals across Europe for over a decade and has found a clear north-to-south, east-to-west gradient in both antibiotic usage and levels of resistance. Northern Europe tends to use fewer antibiotics and harbor less resistance than does Southern or Eastern Europe. Manaia asked whether wastewater treatment plants across Europe would show a similar pattern. The research team collected wastewater before and after treatment in seven European countries: Finland, Norway, Germany, Ireland, Spain, Portugal and Cyprus. They quantified the relative abundance of over 200 known resistance genes in both raw sewage and treated water. "We found the same north-south gradient existed in wastewater," says Manaia. More resistance genes stewed in the raw sewage of southern countries, like Spain, Portugal and Cyprus, than in northern countries. "We demonstrated that indeed wastewater treatment plants are a good mirror of what we find in clinical settings," says Manaia. "This isn't unexpected," says Adam Smith, a environmental engineer at the University of Southern California, who wasn't involved in the study. "But it's necessary to demonstrate that the results from environmental monitoring correlate with results from the clinic," he says. "It is a bit frightening too, and adds to our understanding that what we put into the environment can eventually be relevant to human health." Thankfully for human health, the researchers also found that water treatment plants basically did their job. Drastically fewer resistant bacteria were found in the water leaving treatment plants, though the the north-south differences were still present. Southern countries showed slightly higher post-treatment levels of resistant bacteria than did their northern neighbors. "This result suggests that treatment plants are working properly, but they could be working better than they do," says Manaia. Many of these systems were designed 50 years ago, according to Manaia. "We weren't thinking about antibiotic resistance back then," she says. Pruden says this kind of monitoring isn't currently done in the United States. But widespread adoption "would be a game changer for public health, and not just related to antibiotic resistance." She imagines a world where a community could be put on alert for an uptick in norovirus before widespread infection, or the emergence of new strains of antibiotic resistance could be caught and contained before spreading. "A sewage collection-and-treatment system is the hallmark of a modern civilization," says Pruden. Monitoring levels of resistance in our sewage could be the next stage in their evolution.